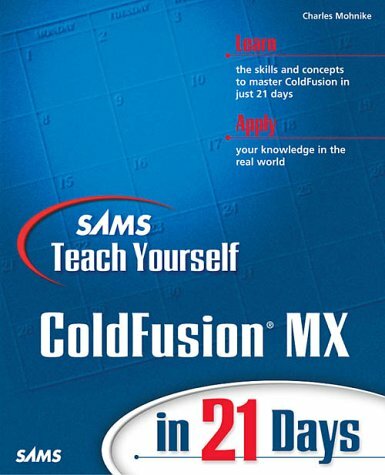 While most other ColdFusion books--as well as Macromedia's product documentation--play largely to those who've honed their programming concepts elsewhere, Sams Teach Yourself ColdFusion in 21 Days taps the vast market of static-page designers who are ready to take their sites to the next level. Drawing on the success of his popular ColdFusion tutorial on Wired's Webmonkey site, author Charles Mohnike provides readers with a fundamental understanding of how ColdFusion works, and then guides them through the use of ColdFusion to create their own applications quickly and easily. ColdFusion's upcoming release capitalizes on the macromedia partnership by adding direct support for Flash, allowing developers to add dynamic content and database interactivity to their animations. In addition, the new version of ColdFusion anticipates the growing demand for Web services by increasing its integration with technologies such as XML and SOAP.